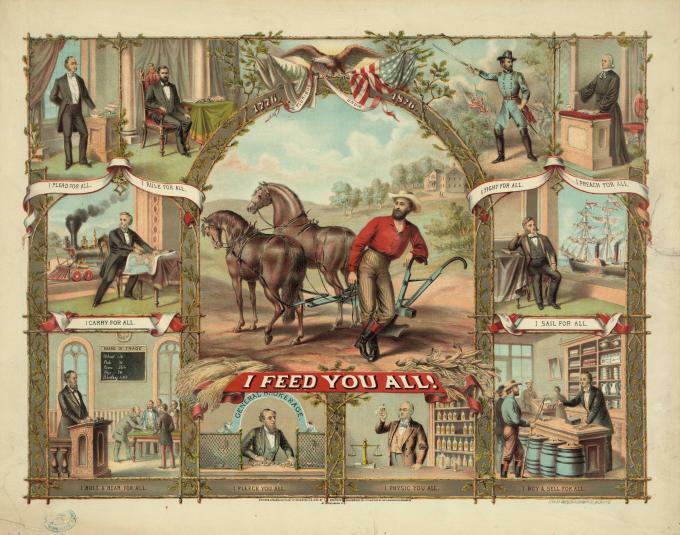 This lithograph, published in 1875, is a modification of the Grange motto, “I pay for all.” It asserts that the farmer is the central character upon which all society relies, with the central image of the lithograph being a farmer behind his plow, captioned, “I feed you all!” This vignette appears within a framework of twigs and oak branches, with stalks of corn and sheaves of wheat in the corners. Surrounding the central farmer vignette is a series of other scenes of professionals, laborers, and military and government agents. Clockwise from the upper left corner appear: a lawyer (“I Plead for All”); a seated President Ulysses S. Grant (“I Rule for All”); an officer leading a charge (“I Fight for All”); a clergyman at his pulpit (“I Preach for All”); a ship owner watching his vessel through a window (“I Sail for All”); a shopkeeper in a general store (“I Buy & Sell for All”); a doctor with a scale and drugs (“I Physic You All”); a banker at his window (“I Fleece You All”); a trader (“I Bull & Bear for All”); and a railroad owner watching his locomotive (“I Carry for All”). I am working on an exhibit for the County Fair on the history of the local Grange. This site may well become one of my favorites as I am a Town Historian and chairman of the committee to rehabilitate a 1820 stone house in our community.